Facelift. 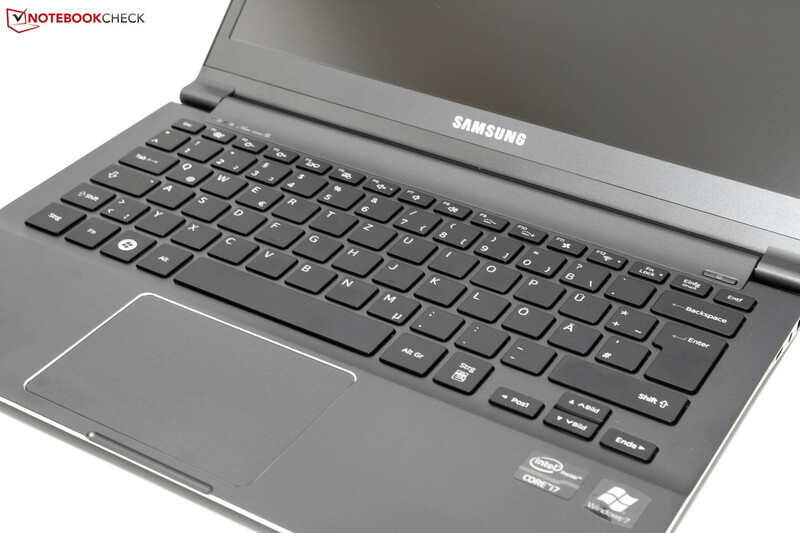 Under the name 900X3C-A04DE Samsung offers the well-known 13.3-inch Premium Subnotebook with fresh hardware from Intel. 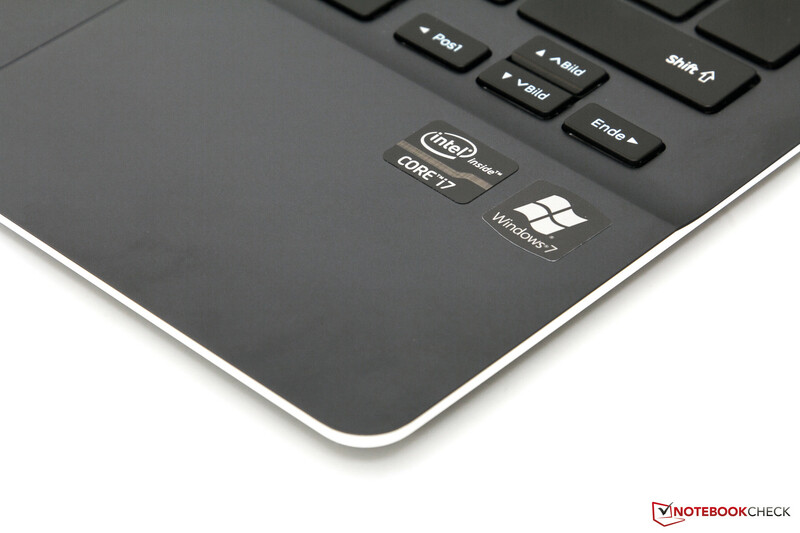 In addition to the matte display with a resolution of 1600x900 pixels, an Intel Core i7-3517U dual-core processor, 4 GB of RAM, and a 256 GB SSD will be offered. Prices start from around 1500 Euros (~$1940). 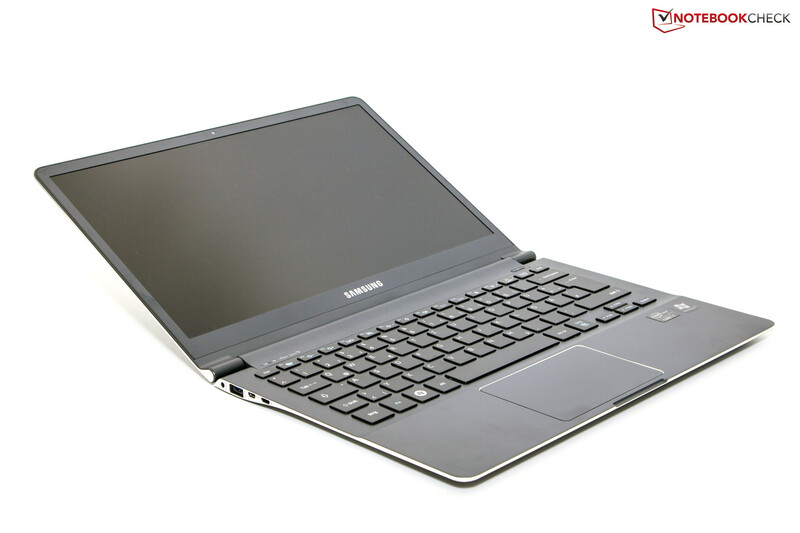 With the 900X3C-A04DE Samsung is offering their third generation of premium subnotebooks. 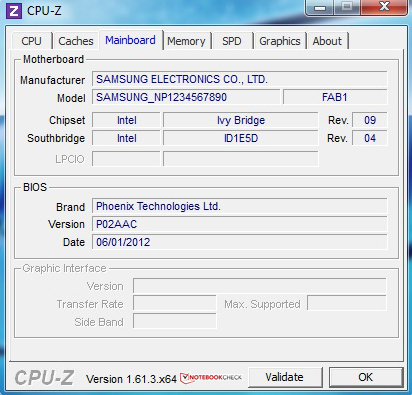 With this update the device receives an Intel dual-core processor from the Ivy Bridge family. In more detail, it is the Intel Core i7-3517U with two cores, a base clock of 1.9 GHz and integrated Intel GMA HD 4000 Graphics. 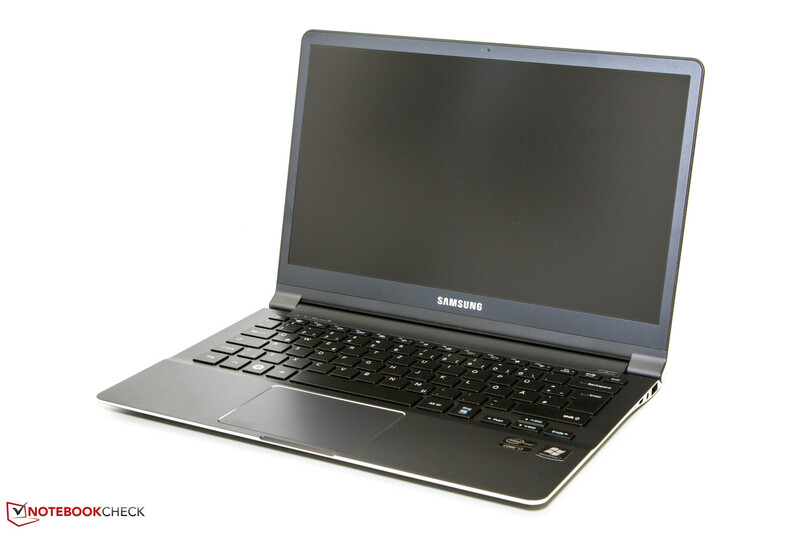 Our test model is the direct successor to the already tested Samsung Series 9 900X3B-A01. 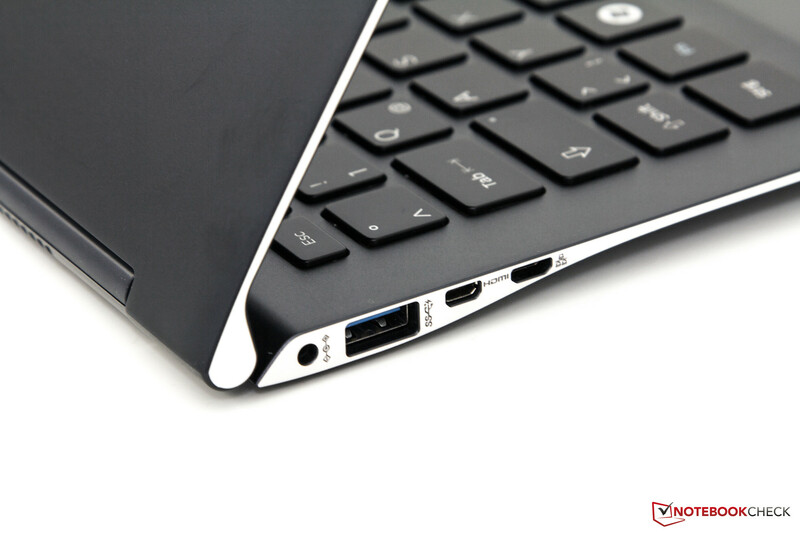 The device is still based on a slim aluminum body, which is being used again without changes. This is why we have called this current review just a test-update, to see what kind of difference the stronger hardware will make in each area of performance. We won't just take a look at power though; we will also be looking at emissions. The cooling system hasn't really been changed at all. 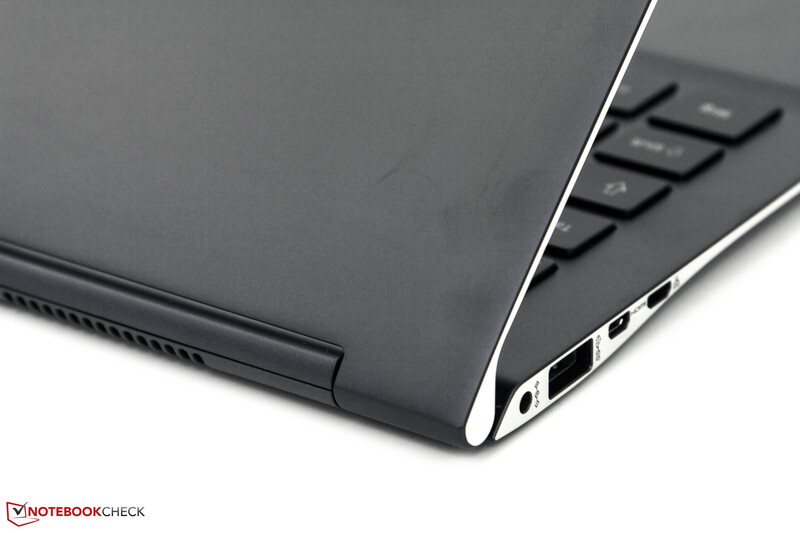 What should remain an important driving force for the 13.3-inch subnotebooks (aka ultrabooks) is the display. 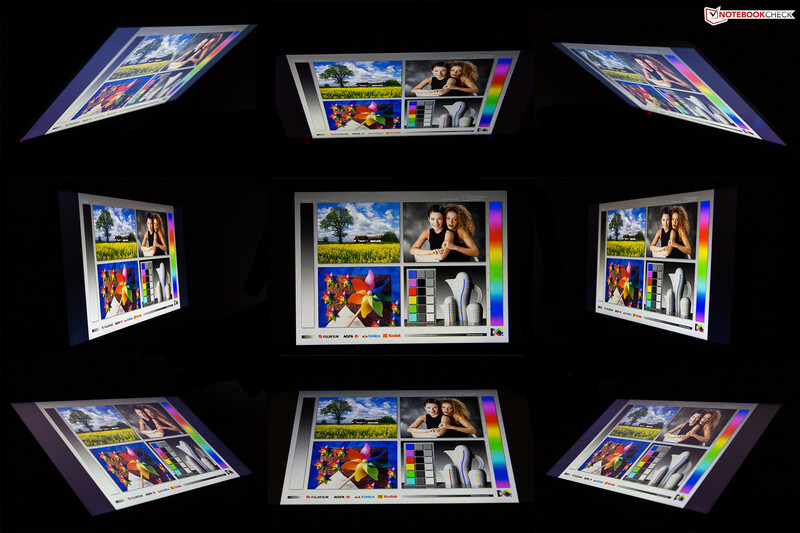 The matte PLS screen uses 1600x900 pixels (HD+). 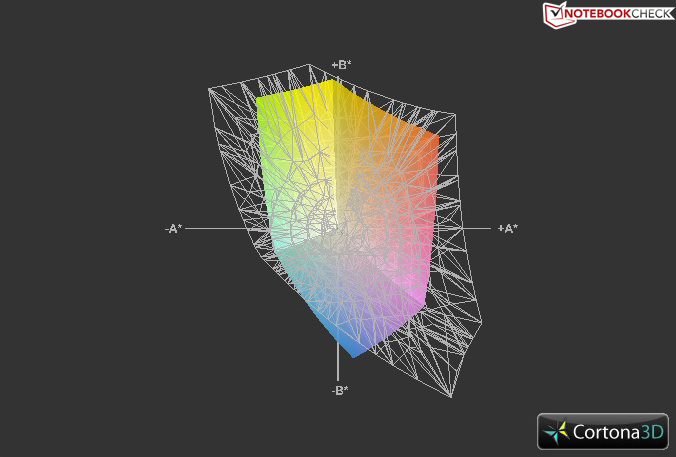 The luminance should be 400 cd/m² according to Samsung. 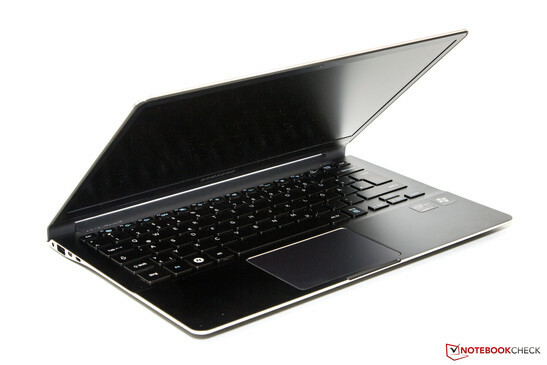 Other specifications include 4 GB of DDR3 RAM, an mSATA-SSD with a 256 GB capacity and current communications capability. You will find out in this test whether or not 1500 Euros (~$1940) would be well spent, and how the 900x3C-A04DE compares against the two main competitors on the market. All of the communication options are up to today’s current standard. 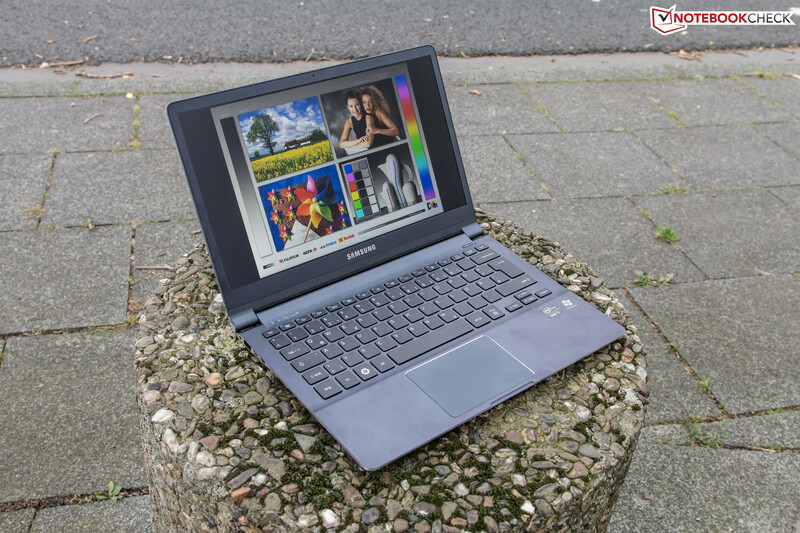 Including WLAN with 802.11 a/b/g/n (Intel Centrino Advanced-N6235) and support for Bluetooth 4.0, the subnotebook is also equipped for wired transmissions (Gigabit). A standard RJ-45 plug doesn't have any room due to the slim design. The connection is made with the included adapter through a proprietary connector on the right hand side of the case. 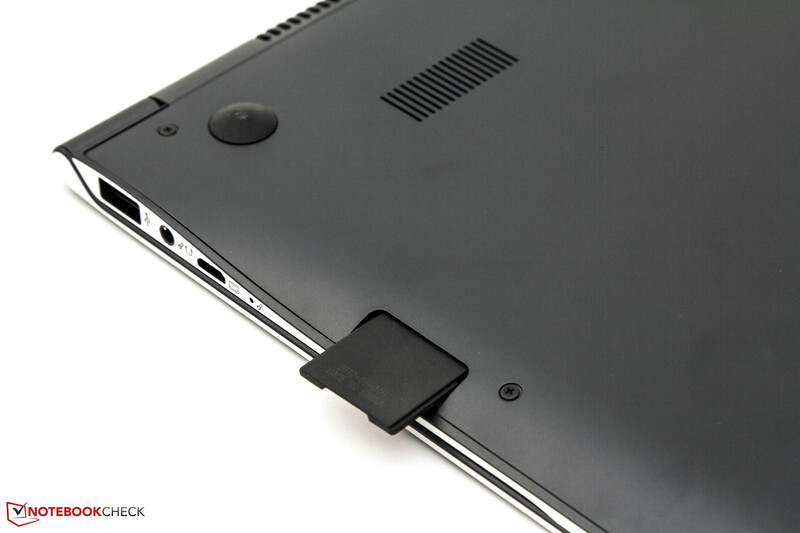 An integrated module for mobile internet connection is not included with this subnotebook. A cheap USB stick would be the easiest solution. After opening the white and rather large package, the device was not there waiting for us. Instead, there is another smaller black box. 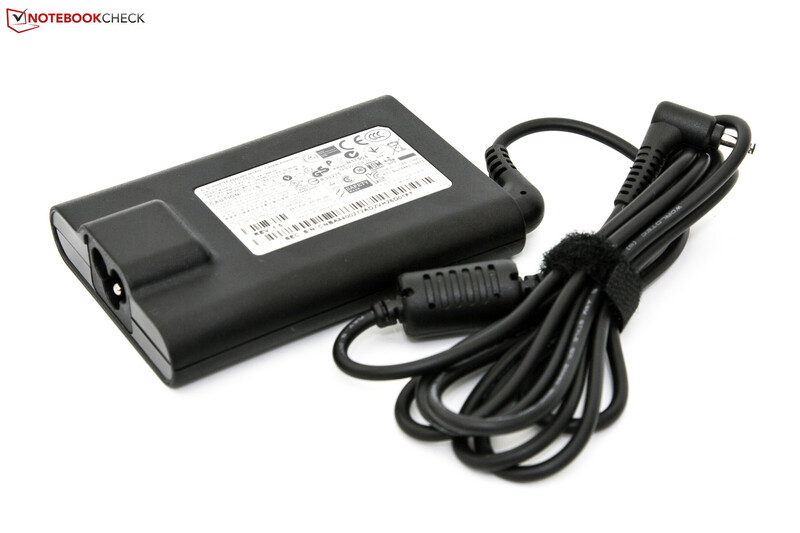 Next to the subnotebook you will find the appropriate power adapter (40 Watt) with the cable, the aforementioned RJ-45 adapter, some documents and a recovery DVD all included. A recovery device in the form of a USB stick would have made a lot more sense to us here, seeing as the device doesn’t actually come with any optical drive. The adapter for HDMI or VGA output is unfortunately not included. Therefore the offered range here equates to a slightly elevated standard, which can be further extended with separately sold products. The underside is quite revealing when compared to the rest of the class. Simple cross screws hold the bottom plate in place. Accordingly, dismantling it can be done easily. In comparison, many manufacturers use specialized Torx screws. Apple utilizes its own specially developed Pentalobe screws which take things one step further, making maintenance almost impossible. Under the hood of the 900X3C the components are directly accessible. The RAM is however soldered onto the motherboard. The battery is only attached with screws, and the fan can be easily removed for cleaning. 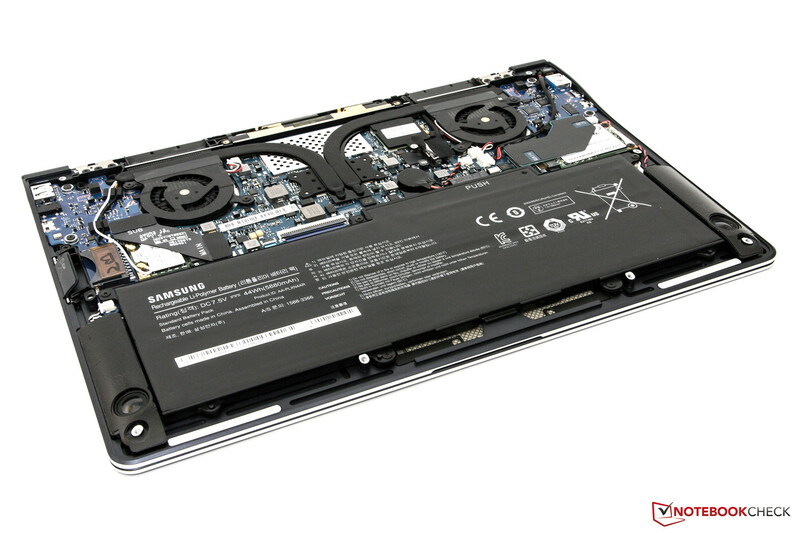 The Solid State Drive (SSD) can also be removed and replaced, although doing so would not be profitable. 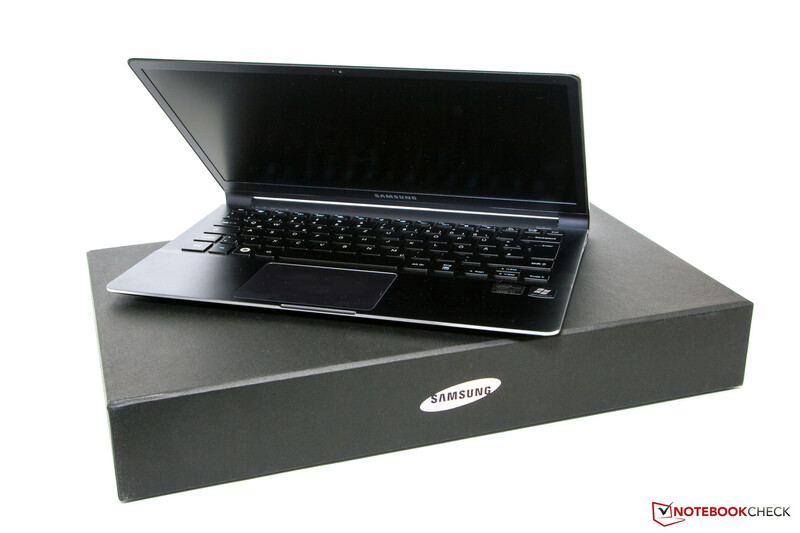 Samsung offers a warranty period of 24-months with this subnotebook, which can be extended at a further cost. If you want, you can opt for a 36 or 48-month warranty period from the purchase date, but this upgrade has to be activated within 90 days from then. The display should continue to be a critical factor influencing purchase decisions for customers of subnotebooks. The screen measures 13.3-inches on the diagonal and works with 1600x900 pixels (HD+) in 16:9 format. 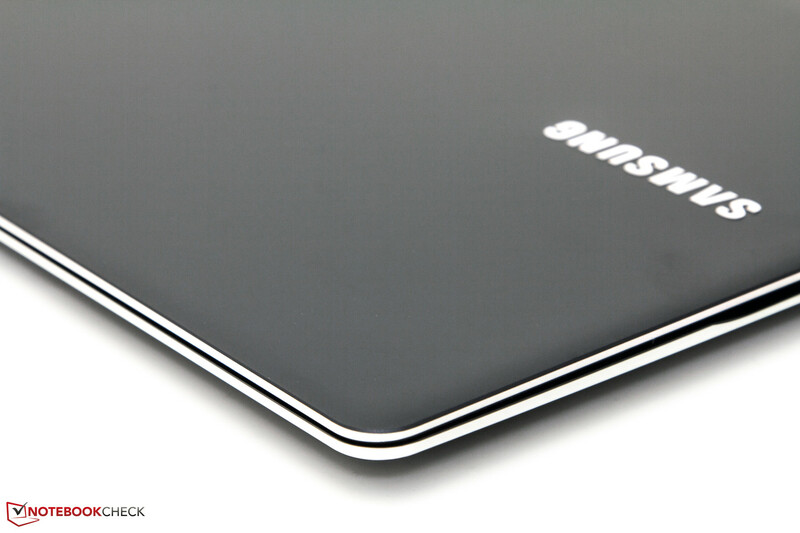 The matte surface remains the same. Samsung is using a new edition panel from Seiko-Epsom, which according to the marketing facts, should have a luminance of 400 cd/m². A screen from their own production line would probably not be profitable just yet. In comparison with cheaper alternatives this subnotebook uses PLS-display technology (Plane-to-Line Switching). This is an evolution from In-Plane-Switching (IPS). The main advantage is the reduced energy usage. Alternative displays to our tested models are not available. Samsung did however show off a Prototype Series 9 with a so-called WQHD-Display at IFA 2012. This panel is 13.3-inches and is packed with 2560x1440 pixels. In this region it is the only competition to the bigger display of the Apple MacBook Pro 15 with Retina-Display. On the other hand is the Asus Zenbook Prime UX31A with a matte FHD display (1920x1080 pixels) which is tough competition to our test model. The also comparable Apple MacBook Air 13 Mid 2012 can't keep up with either of the notebooks, at least in terms of resolution. 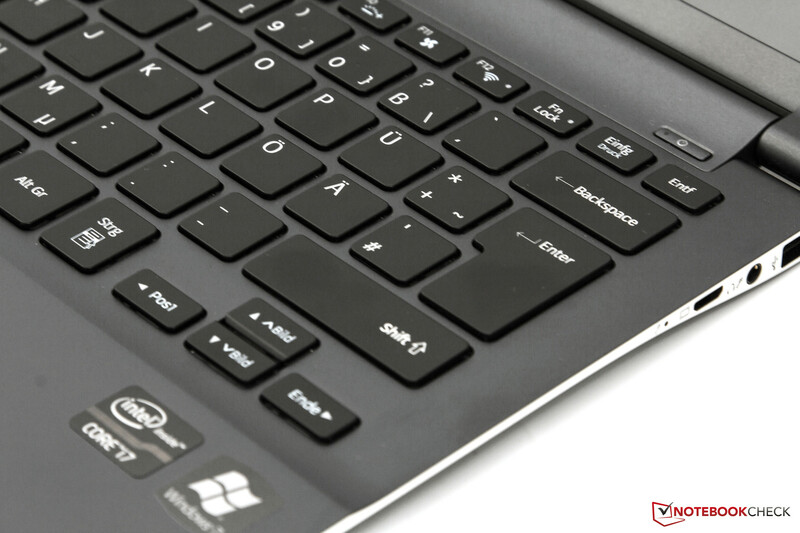 It utilizes a display with 'only' 1440x900 pixels and has a glossy surface. The luminance of the panel type SEC0100 gives a good impression with the first glance at it. 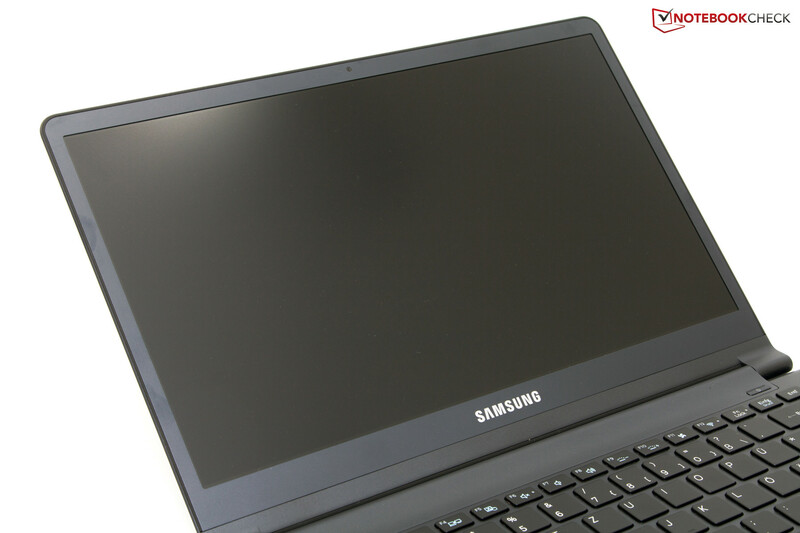 The maximum value of 420 cd/m² is high, and meets the claims of Samsung. Also the average is pretty good with 378 cd/m², although we did notice some uneven lighting here. The differences are generally unnoticeable in daily use. The other values leave us with a good but not amazing impression. The black point level is relatively little, meaning that the contrast ratio soars upwards. This combination pays off especially when watching movies. The UX31A from Asus performs better overall with display tests. The Series 9 is aimed at consumers who do not need a screen with a large color gamut. A comparison shows that the sRGB reference color space, which is important for professional users, is not met. This means that the rival from Asus gains a point here. The MacBook Air 13 Mid 2012 is on the same level as the 900X3C-A04DE. With outdoor use the combination of a matte screen surface, good brightness and a high contrast ratio work well together. The device is usable both in the shade and in direct sunlight. In some scenarios you can even reduce the brightness a bit. In this section there is nothing to complain about. The display lid balance is also made to please: Thanks to the PLS technology the picture remains stable even at flat viewing angles. We couldn't identify any visible loss of light that results in distorted colors or inverted images. Normally the cheaper TN-panels have problems in this test. Under the hood of the 900X3C-A04DE you will find the new components from Intel. The heart in this case is the Intel Core i7-3517U, a dual-core processor with a base clock speed of 1.9GHz, meaning it lies in the upper-middle class. 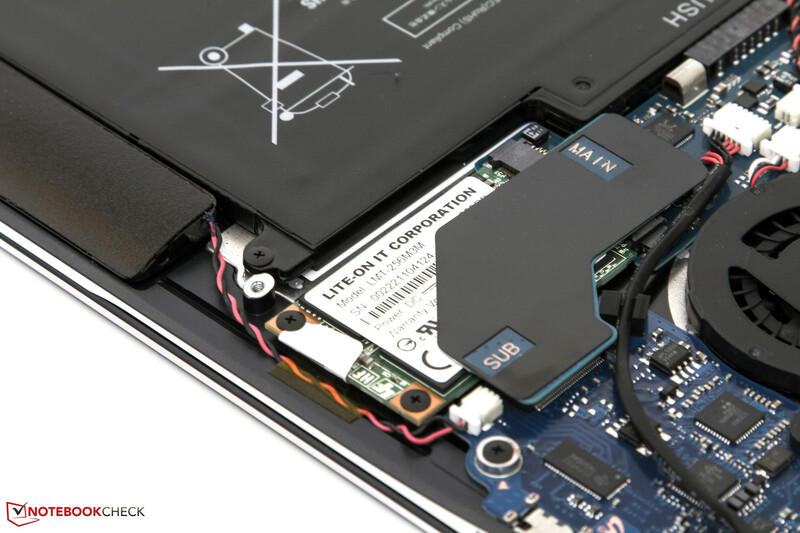 This CPU uses an energy-saving ULV variant (Ultra Low Voltage), wherein the 'U' from the abbreviation could relate to the device class of Ultrabook. Samsung does not however market it as such a device. Next to the two cores there are four threads available (Hyperthreading Technology) and while using the integrated Turbo Boost a maximum power of up to 3GHz (1 core) is possible. 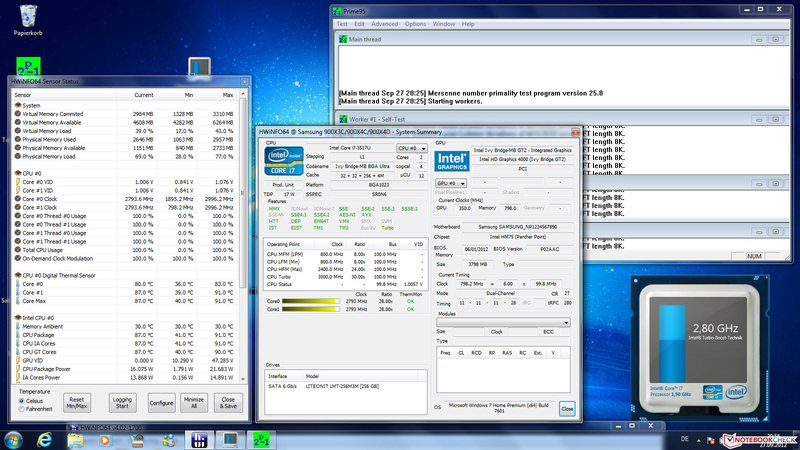 With two cores running the speed keeps up to 2.8GHz. 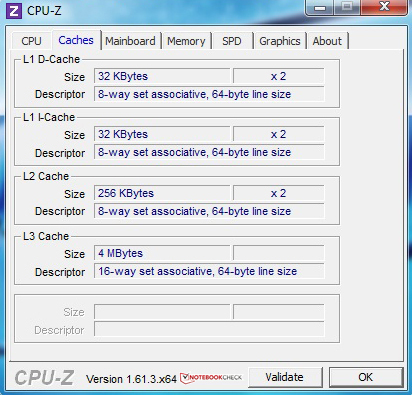 In comparison to the Core i5 dual-core processor (L3 cache: 2 MB) our tested chip uses 3 MB L3 cache. The other features naturally include the integrated GMA HD 4000 graphics chip from the processor, 4 GB of DDR3 RAM and also a speedy mSATA-SSD with 256 GB capacity. The RAM is soldered on to the motherboard, meaning an upgrade isn't on the cards here. For most of today's current multimedia applications this setup shouldn't bring any problems. Before we check on the different benchmarks, we first want to take a look at the DPC Latency Checker. At regular intervals this showed clear fluctuations into the red zone. One consequence of this could be the so-called 'drop outs' when dealing with the live transfer of video or audio material. One known problem in this context is the 'crackling' when using an external soundcard. In the newer CineBench R11.5 the performance difference between the test model and the older Core i5-2467M stays at 27% (2.64 vs. 1.93 points). The Intel Core i5-3317U, as our current comparison model, scored 2.3 points and therefore stays about 13% under the faster Intel Core i7-3517U dual-core processor. With the performance of the system we can't find anything wrong. The loading times are low thanks to the modern flash memory, and the transfer of large files on the memory also races by before your eyes. 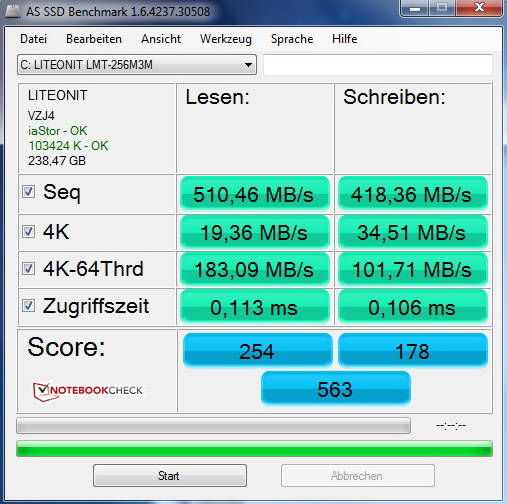 The current PCMark 7 is a benchmark which measure performance of the total package, wherein a fast SSD will clearly improve scores. With a result of 4,549 points the subnotebook is placed at the top end of our data bank. In the immediate vicinity here there are comparable Ultra-Thins with SSDs and powerful gaming machines. As a storage medium there is a Solid State Drive (SSD, SATA III) in the form of mSATA. In comparison to the 2.5-inch industry standard these drives are made especially for slim devices, meaning space requirements are minimized. The model type LMT-256M3M is supplied by Lite-On and boasts a capacity of 256 GB. With transfer speeds of over 400 MBs per second (CrystalDiskMark) and low access times, good performance can be seen. In this section the integrated Intel GMA HD 4000 graphics chip has to prove itself in the synthetic gaming benchmarks from Futuremark. In 3DMark 06 the GPU managed a score of 5,096 points, placing it in the middle of our data bank with plenty to look up at. But first a glance at the 900X3B with the Intel GMA HD 3000. Its result was 3,629 points, leaving it about 29% below. The difference to the Asus Zenbook Prime UX31A is also interesting. 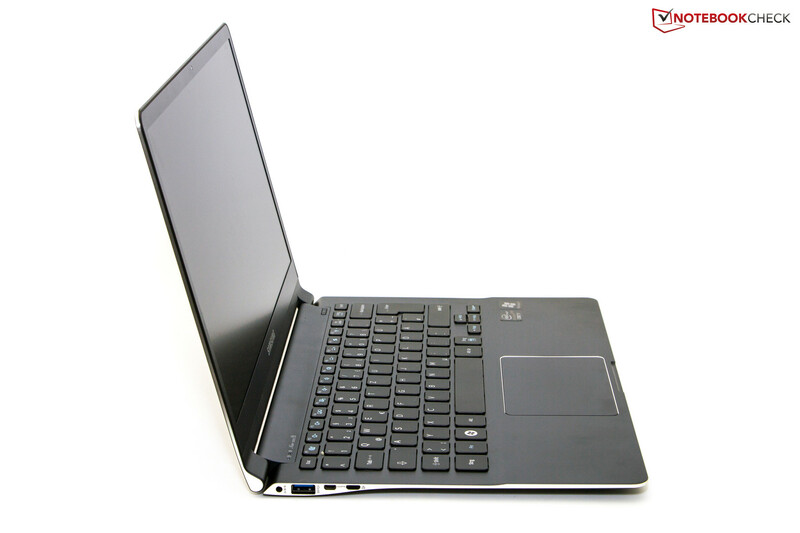 It uses an Intel Core i5-3317U dual-core processor. In this benchmark the difference was generally 20% less than the test model from Samsung. The current MacBook Air 13 performs about 14% better in comparison to the 900X3C-A04DE. Overall the integrated graphics can't be any guarantee for good results in this area. More performance will come from dedicated graphics. 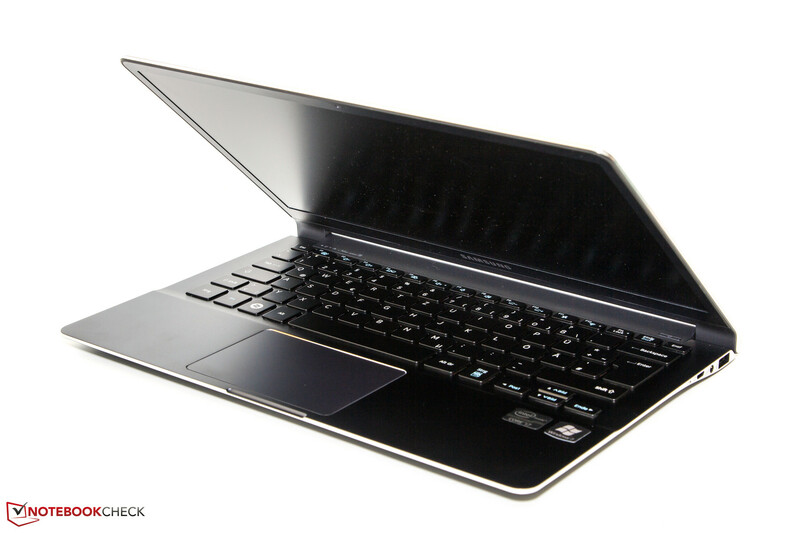 A sleek example would be the Asus UX32VD Subnotebook with the Nvidia GeForce GT 620M and Intel Core i5-3317U. 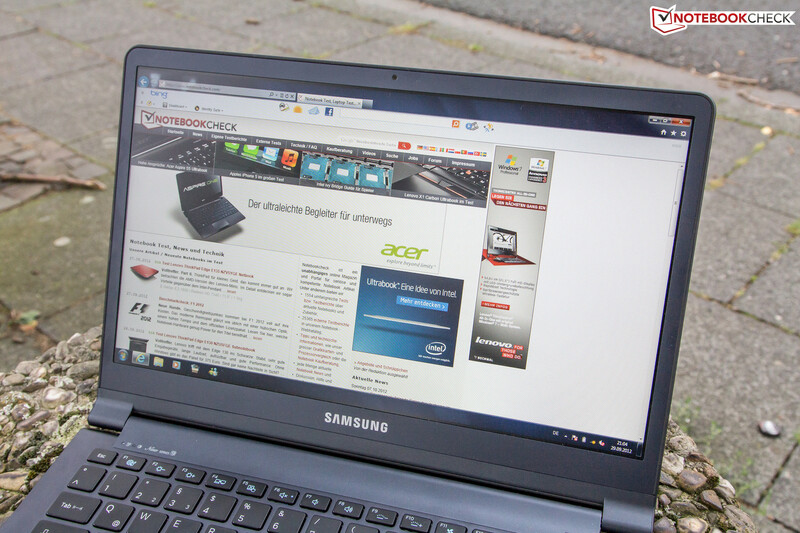 The Ultrabook scored 7,459 points thanks to the pair of equipment in the 3DMark 06 benchmark. The difference to our test model in this case is 50 percent. The integrated Intel GMA HD 4000 graphics is no solution for gamers. The focus rests primarily on multimedia applications, where simple 3D games can be played. These include the current FIFA 13 (High: 42.6 fps), Trackmania Nations Forever or the popular MMORPG World of Warcraft (WoW). With more complicated games such as Sleeping Dogs (7.9 fps with 1366x768 pixels and high settings) or Battlefield 3 the GPU starts reaching its limits quickly. In this sense the graphics are really only for casual gamers who don't have any high expectations in this area. The noise level is and remains an important factor, therefore converting to 8% of the overall result. In idle mode the device stays unobtrusive in the background. In the silent mode the fan is sometimes turned off completely. 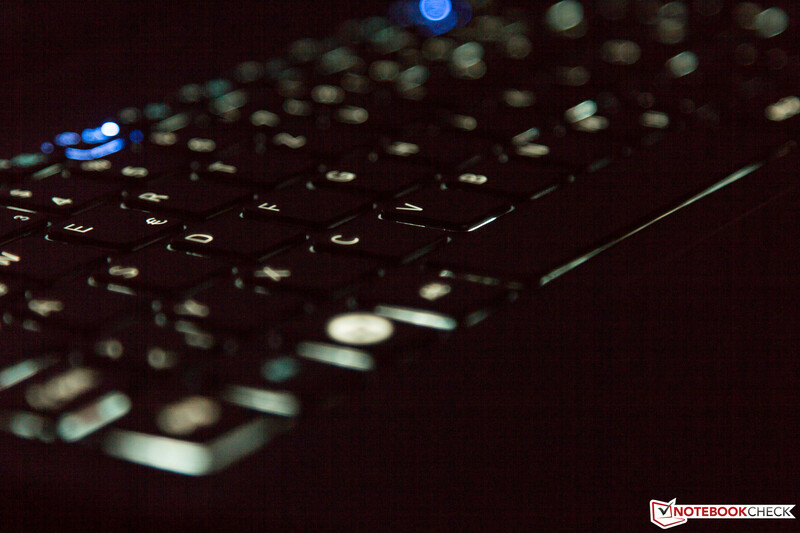 This mode can be engaged directly by using a hotkey function (Fn + F11). With a maximum of 30.8 dB(A) in this scenario the result means you can take the subnotebook to the library or to a meeting with a clear conscience. Even high-resolution YouTube videos in 1080p don't cause any problems for the 900X3C. Under load the device has more noise added, due to the two integrated case fans. At the highest point we measured a noise level of 40.8 dB(A) from a distance of 15 cm (~5.9 inches). This means the test device is a bit louder than its predecessor which had 37.4 dB(A). In everyday use you will almost never be able to fully replicate the conditions of our stress test where we used FurMark and Prime95. The fast speed at which the device returns to normal function after the cooling work is finished has to be mentioned as another positive selling point. In any case the 8% for the temperature will be awarded here. The 900X3B is the direct predecessor with the same chassis and had problems with heat development at the sides when under full stress. Don't forget either that this was with two fans. Next, a look at the values in office use: With a high point of 34.5 degrees Celsius (94.1 °F) above the keyboard, the values stayed consistently in the acceptable range. The chassis stayed between cool and lukewarm temperatures. The palm rests, as important contact points, stay at a comfortable temperature with 30 degrees (86 °F). The bottom side doesn't stray above 34 degrees (93.2 °F), which means resting the subnotebook on your lap shouldn't cause problems. While under full stress the 900X3C unfortunately starts to show a different side of itself, reaching up to 54.8 degrees Celsius (130.6 °F). With the predecessor this value was already at a high measurement of 47 degrees (16.6 °F). 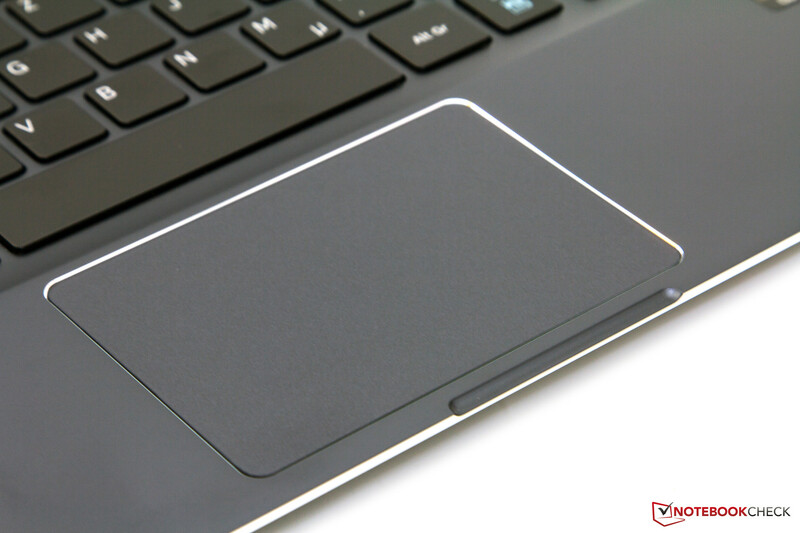 The slightly protruding keys aren't affected too much by this high temperature, and the palm rests don’t get too hot, but the surrounding of the keyboard and the bottom side is noticeably hot. 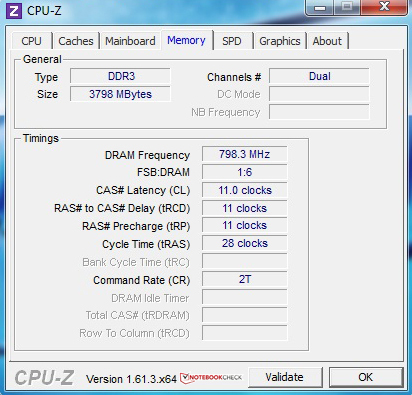 Finally, we take a look at the behavior of the clock speed of the processor. In the stress test (FurMark + Prime95) the Turbo Boost function was turned off, and the CPU ran at the base clock speed of 1.9 GHz. We didn’t notice any throttling here. 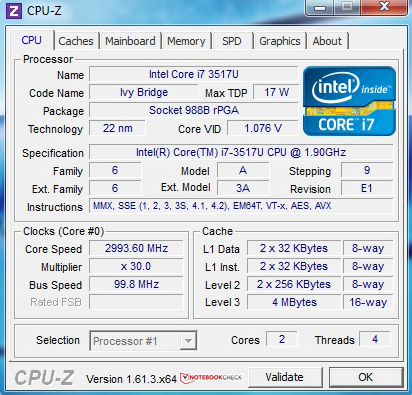 With the performance of the processor with Prime95 there were no thermal problems. 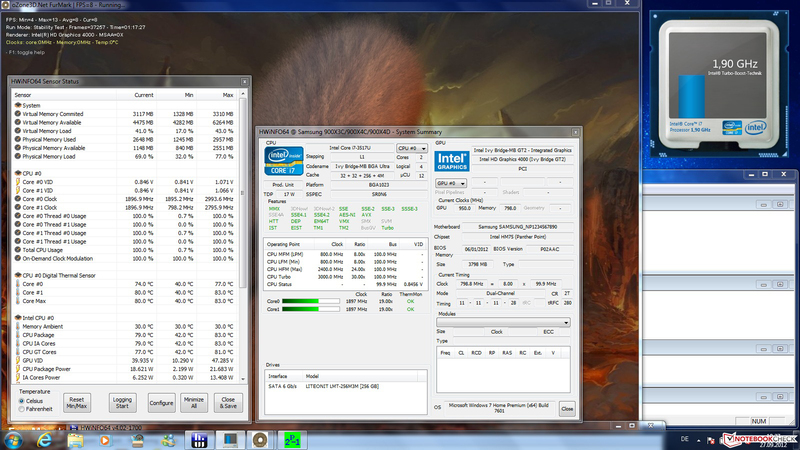 The processor gets hot, but the normal 2.8 GHz in dual-core mode can be called constant here. Overall, there are no complaints for us in regards to this hot topic. With the increased power from the new 3D transistors of the Intel Ivy Bridge processors also comes an increase in power consumption. Particularly with mobile devices, the battery life is an important factor influencing purchase decisions. 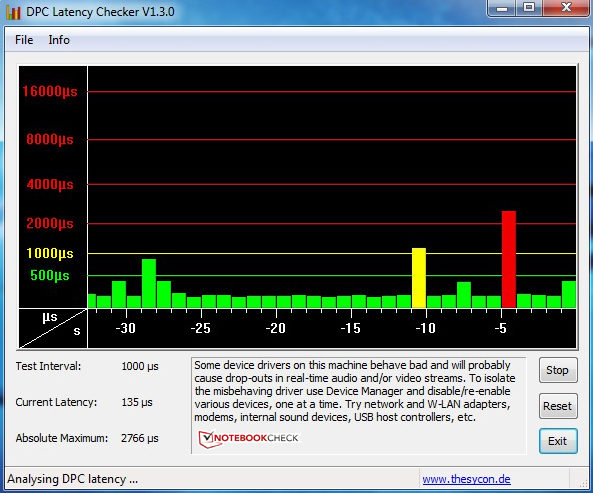 In office use the test device needed between 5.2 and 10.6 Watts. This means it finds itself within the green range. Under stress the usage naturally goes up, where we found a high point of 37.7 Watts which is somewhat unremarkable for this configuration. The consumption comes from a Lithium-Polymer battery with a capacity of 44 Watt-hours (5880 mAh). 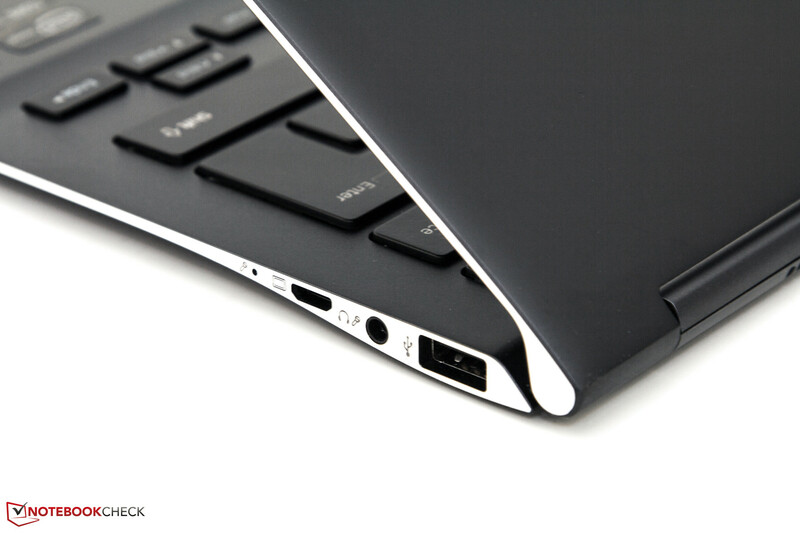 This is found under the palm rests, and due to the slim design is securely integrated. The start of the three measurements is with the Classic Test from the tool Battery Eater, wherein the system is set to maximum brightness, all wireless technology activated and high performance profile activated. After 133 minutes the total capacity was exhausted. The 900X3B only reached 105 minutes in comparison (-21%). The other extreme is the Reader's Test: this involves reading text documents with the minimum brightness, deactivated wireless modules and an energy-saving profile. The result here is a compelling 11 hours and 31 minutes. With the same test the predecessor had to settle for a time of 7 hours and 58 minutes, showing it is clearly beaten (-31%). A realistic measurement simulating everyday use is done through 'WLAN surf test'. While running a standard screen brightness of 150 cd/m², every 40 seconds a new internet page is loaded via a page script. Bluetooth is deactivated and the power profile 'balanced' is used. The test model reached a good result of 6 hours and 47 minutes (407 minutes) in this scenario. 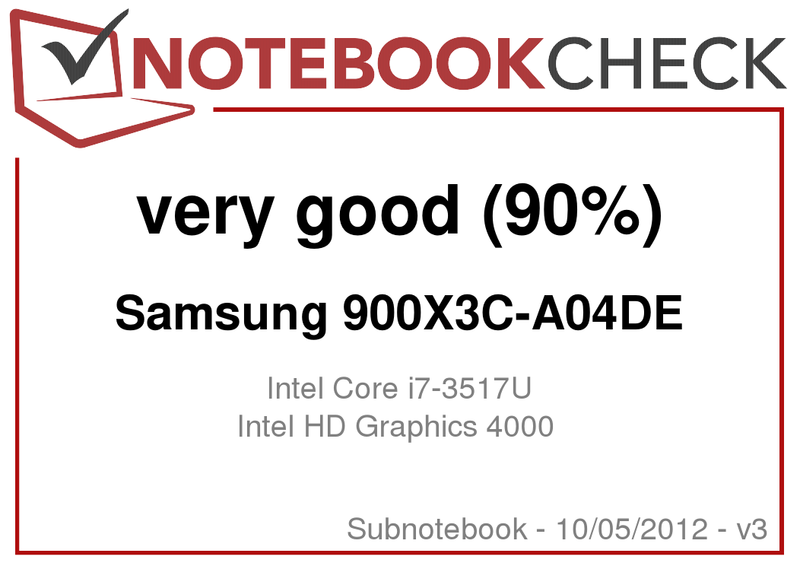 The Samsung Series 9 900X3B, the Asus Zenbook Prime UX31A and the Apple MacBook Air 13 Mid 2012 reach scores here of only 296 (-27 %), 282 (-31 %) and 363 minutes (-11%) respectively. In this area the revised series 9 performs very convincingly. 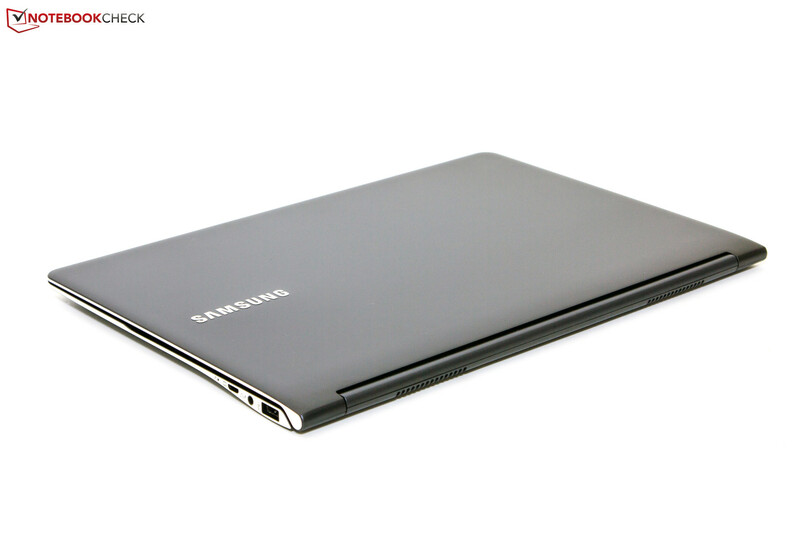 The Samsung Series 9 900X3C-A04DE packed with fresh hardware has left a good impression here. We were pleased by the case, the matte PLS display with a resolution of 1600x900 pixels is just about perfect, the input devices are well designed and you can see the running times for yourself. The Intel Core i7-3517U dual-core processor with its integrated graphics used here provides good application performance, meaning that an upgrade from the direct predecessor with the same case might actually be worthwhile. On the flip side, the problem with packing in new hardware without further adjustments can be seen in respect to the emissions. Under stress the fan is still clearly audible, and the surface temperature does rise to somewhat high levels when compared to its predecessor. Aside from the current communications options, the interface range is still straightforward enough. In terms of usability, the hard to reach card reader and the missing adapter for VGA and HDMI does cause us a bit of grief. Cleaning the two case fans is fairly simple. On the other side, possibilities for expansion are greatly reduced. 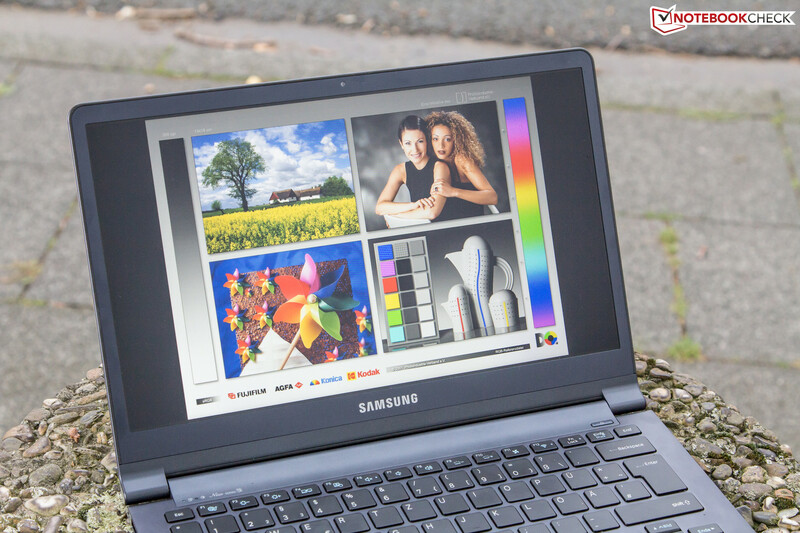 Overall, with the Samsung 900X3C, we are talking about a very successful device, which at the moment can only be compared with two strong rivals in the premium subnotebook class. The prices from 1,500 Euros (~$1940) are quite justified in this case, although this sort of price range is definitely not available to everyone. 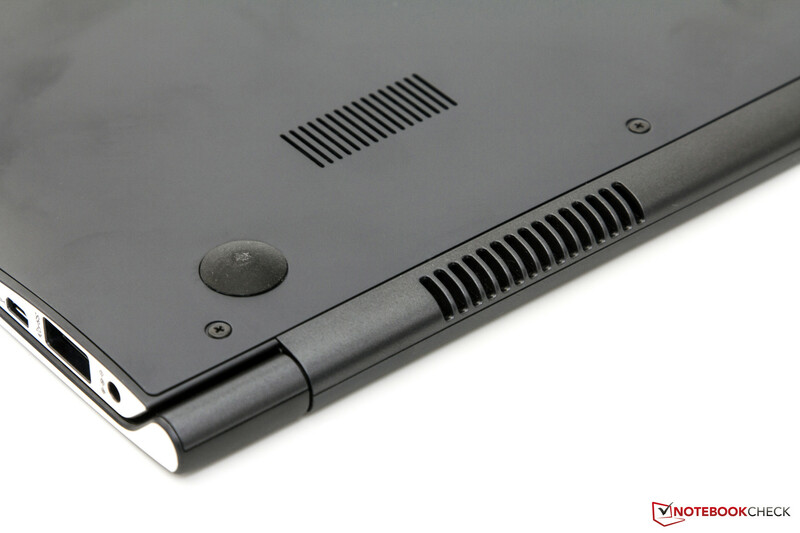 The slim case in 'Mineral Ash Black', the matte PLS display (1600 x 900 Pixel) and the system performance. 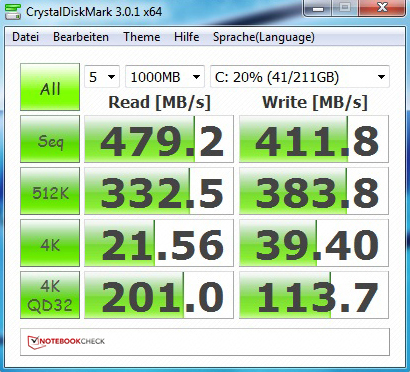 The fast mSATA SSD (SATA III) contributes its fair share aswell. 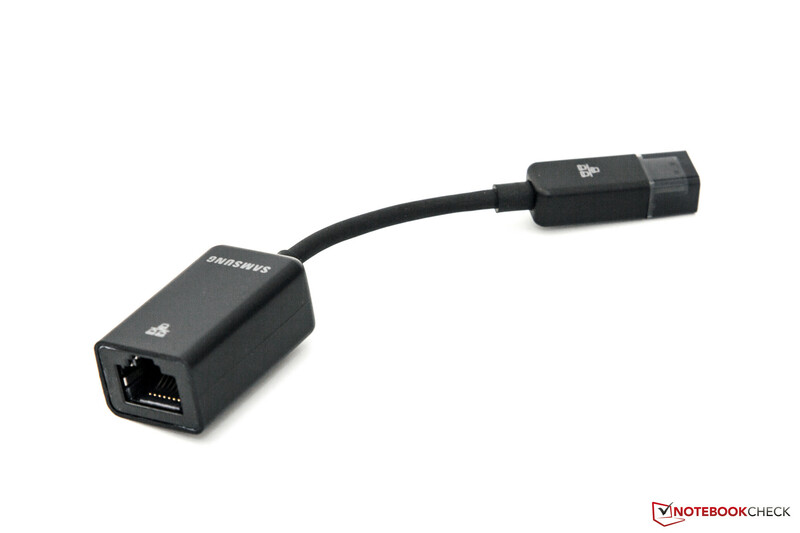 A second USB 3.0 port and the possibility to upgrade the RAM. An integrated WWAN module in this clase would be an excellent selling point. Big suprises stay away from this device. 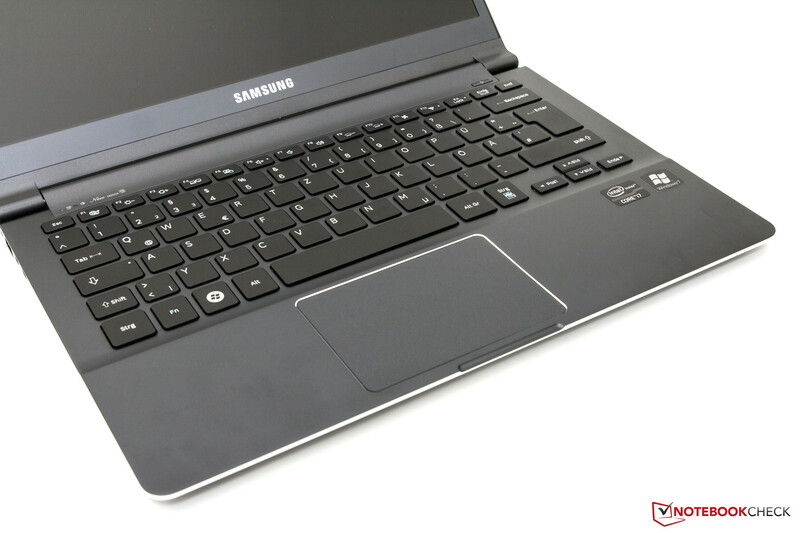 Considering the new hardware, Samsung could have modified the cooling system. Premium devices with 13.3 inch screens. 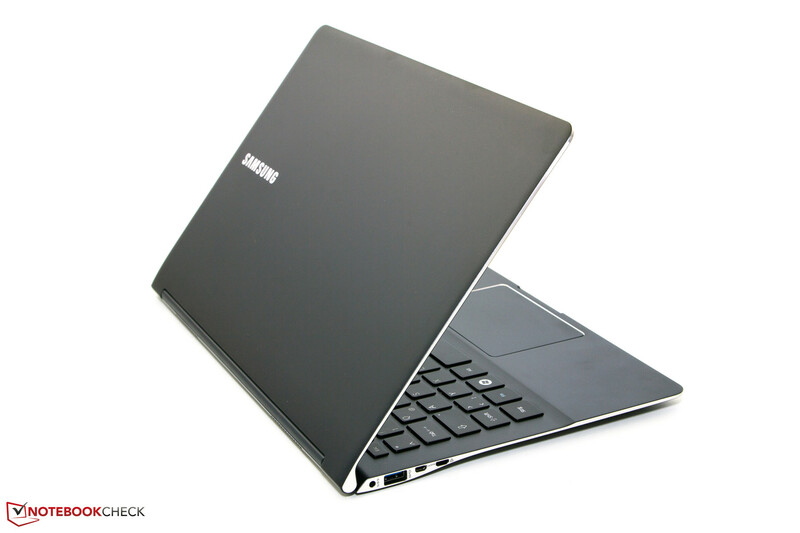 This includes the Asus Zenbook Prime UX31A with a FHD-display and the Apple MacBook Air 13 Mid 2012. 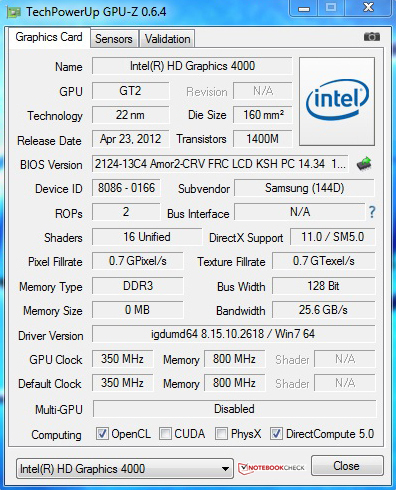 Another alternative: Acer Aspire S5-391-73514G25akk with the same processor but an overall weaker panel. In the Business area: Lenovo X1 Carbon with a very bright and matte HD+ screen.